Today, comic books are on the forefront of progressive, inclusive thinking. Right now there are several mainstream comics titles prominently featuring — if not led by — LGBTQ characters. Iceman, Batwoman, America Chavez, Teen Titans (featuring the new Aqua Lad), Justice League of America (The Ray) and U.S. Avengers (Pod and Iron Patriot) are just a few. These days gay readers can find no shortage of representation in the market. Julio Esteban Richter (Rictor) was introduced in X-Factor Vol. I #17 in 1987. A seismic-powered mutant and the son of a Mexican crime family, he joined Xavier’s New Mutants and had an on-again-off-again relationship with fellow (female) New Mutant Wolfsbane. He eventually joined up with Cable’s X-Force, which is where he met Shatterstar. Rictor and Shatterstar formed a strong friendship in the pages of X-Force and left the group to put an end to Rictor’s family’s illegal arms-selling business. In the pages of X-Factor Vol. II #45 in 2009, a de-powered Rictor reunites with Shatterstar and they finally share an on-panel kiss, indicating that perhaps their friendship was always something more. Writer Peter David’s positive and realistic portrayal of Rictor’s and Shatterstar’s relationship earned him a GLAAD Media Award in 2011. 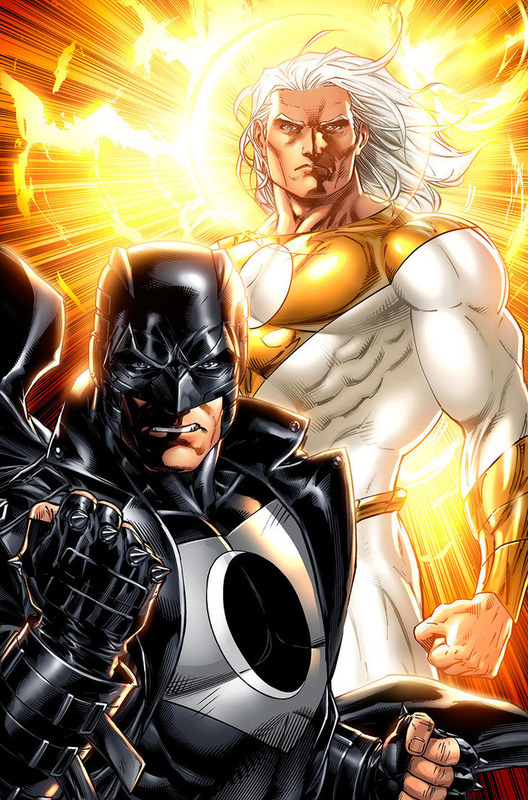 Originally part of the Wildstorm Universe, Apollo and Midnighter were introduced in Stormwatch Vol. II #04 in 1998. The only survivors of a black-ops super team (designed as a pastiche of DC’s Justice League), they were recruited and then betrayed by Stormwatch’s malevolent director, Henry Bendix. After their disastrous first mission, they lived and fought crime in secret for five years, in which time they grew close and fell in love. After Bendix was deposed, Apollo and Midnighter came out of hiding and soon helped form a new group called The Authority. While the nature of their relationship was often alluded to, it was officially revealed in The Authority #8. And in issue #29 they were married and adopted their infant teammate Jenny Quantum. Since then, the Wildstorm Universe was absorbed into the DC Universe. Both Apollo and Midnighter have appeared (with altered origins) in the Midnighter solo series, the Midnighter and Apollo mini series, and they’ve guest-starred in other DC titles. Another fun fact: the first two runs of The Authority — issues 1-12 by Warren Ellis and Bryan Hitch, and issues 13-29 by Mark Millar and Frank Quitely — are some of the absolute best, big-picture, real-world, far-reaching, game-changing comics. They are excellently and thoughtfully written, and they’re beautifully drawn. One warning, though: they are for mature readers, and the violence is gory and intense. Knowing that, the books are available in trade paperbacks and collected in “absolute editions” (oversized, slipcased, hardcovers with extras). 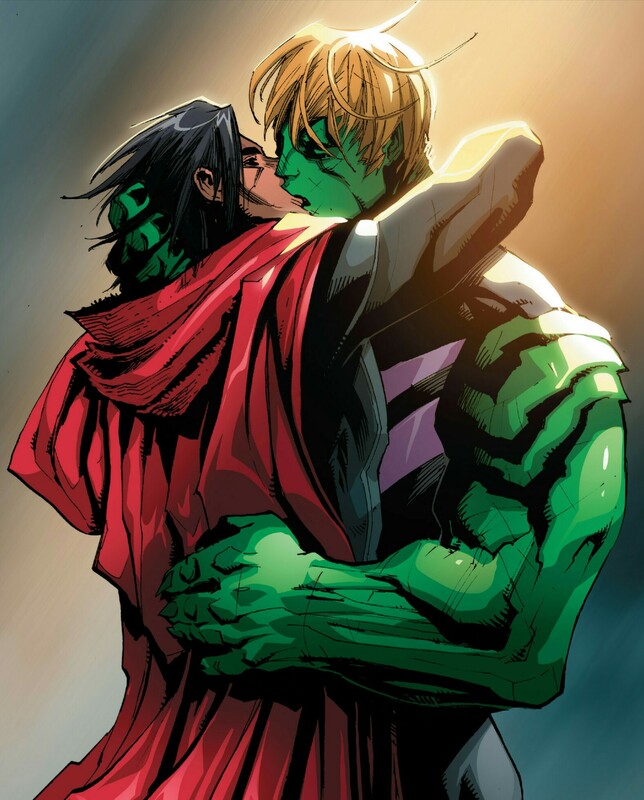 Hulkling and Wiccan arrived on the scene as an already committed gay couple in the pages of Young Avengers #1 in 2005. Created by openly gay screenwriter Alan Heinburg — whose latest credits include the screenplay for the 2017 movie Wonder Woman — Teddy “Hulkling” Altman and Billy “Wiccan” Kaplan were gathered together with other young heroes as part of a plan by the Vision to form a new team of Avengers in case the original team disbanded. Originally Hulkling was an homage to the Hulk, with a similar large, green appearance and super-strength. As it turns out, he’s actually the secret child of Captain Mar-Vell and the Skrull Princess Anelle, from whom he inherited his strength and shape-shifting abilities, respectively. Together they have served as Young Avengers throughout two mini series and one ongoing series, and they’re since graduated to becoming “New Avengers” in the book of the same name. Though effectively retired in Manhattan now, this is the Marvel Universe, so I can see them called back into action sooner rather than later. Do you have a favorite gay superhero couple?